Light, also known as visible light, is electromagnetic radiation visible to the human eye. Light, like all electromagnetic radiation, consists of photons. Photons have very specific properties, such as wavelength and frequency, and those observable properties determine the qualitative properties, such as color, that are perceived by the eye. Intensity is not a property of the photons, but rather their number. Visible light makes up only a small portion of the electromagnetic spectrum. Types of electromagnetic radiation with higher energy than visible light include x-rays and ultraviolet light. Radio waves and infrared have lower energy. Light exhibits behavior characteristic of both waves and particles. Until recently it was deemed impossible to detect both the particle nature and the wave nature of light at the same time, as they were believed to be two representations of the same phenomenon. This has in recent years been improved and the dual nature of light (wave and particle) has now solidly been proven in combined experiments. The five behaviors of light can generally be classified as either particle or waveform behaviors. The particle-like behavior can be demonstrated photoelectrically and plasmonically, and the waveform-like behaviors include refraction, interference, diffraction, and reflection. 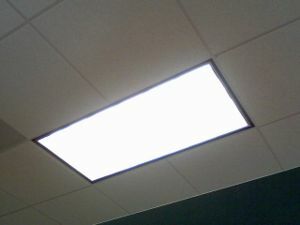 Fluorescent light; the image sensor has been adjusted to capture fewer photons. See photoelectricity. In a photoelectric environment, large quantities of photons (which carry a fixed amount of energy) interact with the electron population of a solid. Based on the type of solid, either a reduction or increase in the displacement of electrons can occur. The energy of photons required to displace those electrons has to exceed a certain amount. If electrons are displaced, the extra energy will be transferred kinetic energy of the electrons. If a greater light intensity exists, more photons will interact with more electrons. The speed of the electrons is a function of the type of solid and wavelength of light but independent of the brightness of the light. There is a direct correlation between the energy of those photons and the frequency of the light used. It should be noted however, that not all electrons can be displaced. Refraction occurs when the speed of light is reduced at the point of intersection between light and another medium. The angle of refraction is dependant on the effect of change in the speed of light. A larger reduction in the speed of light within the medium will result in a greater angle of refraction. Diamonds, for example, have a much greater index of refraction than water. Index of Refraction or 'Refractive Index' is a constant for a given pair of materials. Refractive Index = Speed of Light in Material A / Speed of Material in Material B. It is also written as AnB and is the refractive index of material B relative to material A. The light is incident on material A and the refracted light is in material B. If the incident light is in vacuum this value is called the absolute refractive index of material B. Therefore, the absolute refractive index of vacuum is 1. 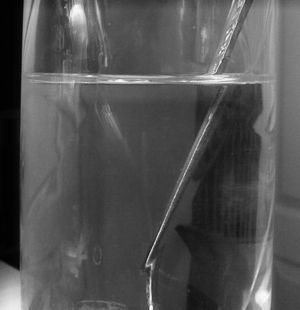 Refraction causes objects to appear distorted; in this case a spoon in a glass of water appears to be "broken" near the top. Interference occurs when two or more waveforms of light interact with each other. This phenomenon can be classified into two types: constructive, and destructive. Constructive interference is when two or more waveforms come together to form a larger and stronger wave. Example: White light is made up of many different waveforms. By projecting the three colors that our eyes have receptors for (red, blue, and green) in a triad, a white light will be seen at the point of intersection. This is the same reason why on LCD screens all colors are required to function to produce white. Destructive interference is when two or more waveforms come together to cancel each other out to make a weaker wave. Example: On a soap bubble, white light is destructed into different observable color 'bands'. The darker colors represent places where light is destructed. Diffraction is the visual appearance of light changing shape in accordance with obstacles in its direct path. When light is projected to a plane that has only a small opening for light to pass through, the location at which light is allowed to continue can be identified as a single point source of light. This single point does not limit the projection to only the shape of the point; rather it is re-emitted in the widest possible scope. Reflection happens when light is transmitted to a medium, absorbed, and re-emitted with the same amount of energy. Reflection can happen in one of two ways: specular, and scattered. Specular reflection occurs when light is projected onto a smooth surface at a definite angle. Scattered reflection is the reflection of light at various different angles. 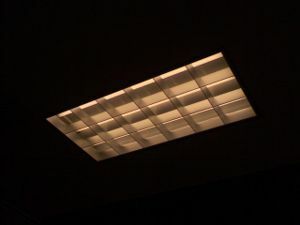 Light is seen as being quantized, i.e. containing discrete packages of energy as reflected by one particular wavelength emitted. These quantized packages are called photons. Any ray of light contains numerous photons, each of which has its own energy and therefore wavelength. However, most sources of light will generate photons of various frequencies, an important exception being monochromatic light sources, such as lasers. This page was last modified 08:49, 1 November 2010.